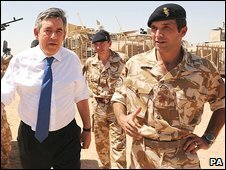 Gordon Brown has said he is hopeful he will be able to persuade countries both in and outside Nato to send more military personnel to Afghanistan. The prime minister said he had "taken responsibility" for making the case for reinforcing the Afghan effort and believed "burden sharing will happen". He told the BBC his strategy was "in line" with the US, which is considering how many more troops to send. US President Barack Obama has said a decision will be taken "very soon". The focus of the mission, Mr Brown told BBC Radio 4's Today programme, was to weaken the Taliban and strengthen Afghan institutions so they could take control of their own affairs and "resist" the threat of terrorism. "Troops will start coming home"
"I believe we can succeed"
"There's got to be burden-sharing"
"Criticism of me... is nothing"
This would eventually enable British forces to come home knowing that their mission was a "job well done", the prime minister added. "Our strategy is now in the right place," he said, adding that there were always "periods" during a war when strategy was questioned. The UK has 9,000 troops in Afghanistan and is willing to send another 500. But this is conditional on other countries in the alliance - excluding the US - providing a further 5,000 troops. The prime minister said he was "sending people" across Europe and further afield to make the case for more troops. "I believe I can persuade countries who said only a few weeks ago they would send no more troops to Afghanistan that if we are training the Afghan forces, that if there is a way forward that allows their troops to come home over time that it is right for them to contribute troops as well and so burden sharing will happen." BBC security correspondent Gordon Corera said European governments were waiting to hear the results of the White House review of US strategy and troop numbers before committing themselves. Speaking in Japan, President Obama said a decision was imminent but stressed that he would be sending a "clear message" that it would not be an "open-ended commitment" and that Afghans must ultimately provide for their own security. The president's top military commander in Afghanistan, Gen Stanley McChrystal, is said to have requested 40,000 troops. However, Karl Eikenberry, the US ambassador in Kabul, has voiced concerns - shared by many of Mr Obama's advisers - about a surge in numbers because of concerns over Afghan government corruption. Mr Brown said he believed Mr Obama's views were very much "in line" with the proposals put forward by the general. He also said he believed President Karzai was "willing" to take steps to clean up his government but he needed international help to do so. The UK's is the second largest contributor to the 71,000 strong International Security Assistance Force, of which half are American. Lib Dem leader Nick Clegg said the UK and US had one "last chance" to show they had a plan for success in Afghanistan. Writing in The Times, Mr Clegg said that unless they could come up with a credible strategy, he "would struggle to look British voters in the eye and say that we should carry on with the war". "There are many people who are beginning to believe withdrawal is the only option," wrote Mr Clegg. "If we fail to adopt a new approach, it inevitably will be." Elected representatives from Nato countries meeting in Edinburgh have been told the battle against the Taliban is a struggle between the "civilised world and a type of barbarianism". US Congressman John Tanner, president of the Nato parliamentary assembly, said countries had to come together to fight "evil" as they had done during World War II. Foreign Secretary David Miliband will address the conference on Tuesday.